Although there are parts of Los Angeles, and Phoenix, where you see people walking, walking is actually rare in those towns - these places were designed for cars, and grew up with the automobile. 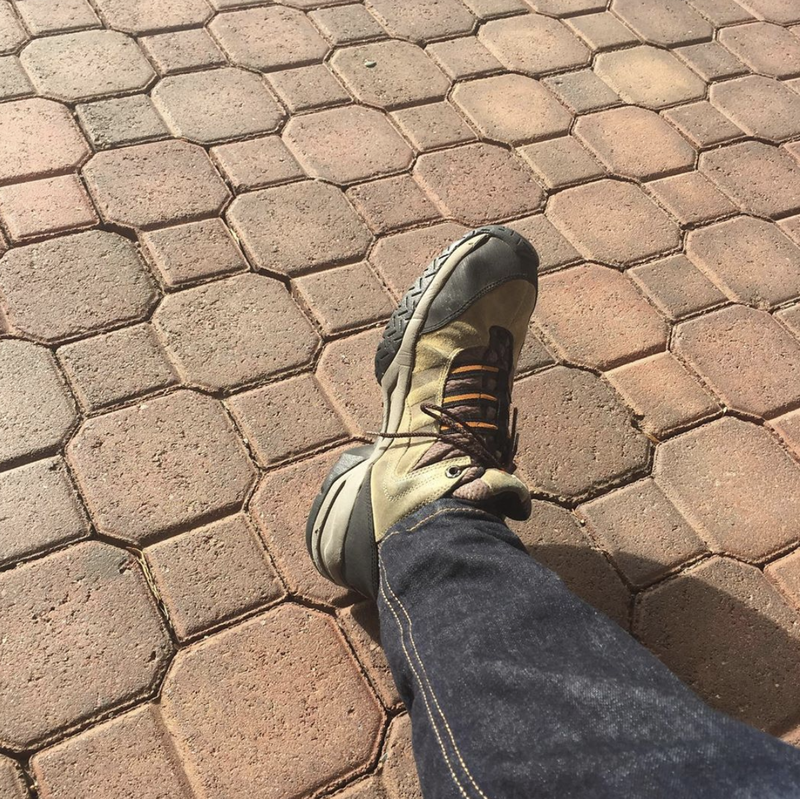 When I lived in Los Angeles, in the 1980s, I rarely walked. Of course I'd walk along the beach, or in a park, but very rarely along the street. There was a song at the time called "Walking in LA" which said that "nobody walks in LA", and more specifically "only a nobody walks in LA". In other words, if you didn't travel in a car, you were a "nobody". It's a tough attitude, and you still see it in Los Angeles and Phoenix, where cars are king and anything other than cars, such as bicycles or pedestrians, are seen as an annoyance. Of course things are changing, and many of the new neighborhoods, and the updated older ones, are now including what I call "human scale". Not just narrow sidewalks inches away from traffic, but nice wide sidewalks, including trees. Cars are still king, so it can be difficult to keep them from blocking sidewalks, or parked where people need to walk, so it's a continual challenge. People who travel in cars tend to have an attitude that they are "somebody" and people who are walking are "nobodies". It's not always true, but it is most of the time. As you can tell, I walk a lot nowadays. I live in Glendale, which is a suburb of Phoenix, in a neighborhood that was built in the 1980s. And as soon as you get away from the neighborhood streets, you're walking just inches away from cars going at what I call "freeway speeds". Walking along the sidewalk on 67th Avenue feels as if you're walking along the shoulder of a freeway. The speed limit is nominally 40, but 50-55 is considered a safe speed, and often cars are going even faster. The turn lanes into the shopping centers are designed more like freeway exits, and are designed to be taken at a fairly high rate of speed. I really can't blame someone in a car being unable to avoid pedestrians at the speeds that are completely normal. It's just a bad design for pedestrians. It's very good for cars! Don't get me wrong - I love cars, and they are the best way to get around Phoenix, and Los Angeles. When you're inside of a car, there's a feeling of safety, not to mention the air conditioning! Outside of a car, there's a feeling that if anyone sneezes, or looks at their phone, they're gonna be up on the sidewalk at high speed, running you over. It happens. There really isn't a solution for this in a neighborhood like mine. I try to stay away from the main streets, but that's where the Neighborhood Market is, so I have no choice. I wouldn't ask the city to close a lane so that I could have a safer place to walk, and maybe some trees, because that's what would have to be done. As a pedestrian, I'm very rare so I can't imagine any reason to put so many other people to that inconvenience just for my safety and comfort. I understand. I'll continue walking. Thank you for walking with me. 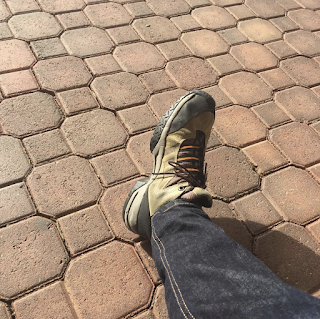 Image at the top of this post: My favorite walking shoes, in front of the place where I get my haircut, at 59th Avenue and Peoria, Glendale, Arizona.